Compressed hydrogen has received a great deal of attention over the last 70 years as a result of the unusual properties proposed for the metallic, monoatomic phase at high pressures, including a predicted high superconducting transition temperature and the possibility of novel quantum states associated with combined superconductivity and superfluidity. Recent experimental and theoretical studies constrain the pressures required for generating the metallic state in hydrogen to above 400 GPa, above the range of current experimental methods for confining hydrogen and performing measurements on the material. Meanwhile, more recent research concerns the behavior of a number of hydrogen-rich compounds, with the anticipation that understanding their behavior at extreme conditions will provide insight into their potential as energy materials in their own right, as well as give clues to the mysteries of metallic hydrogen. 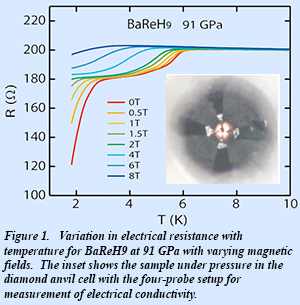 BaReH9 is the most hydrogen-rich ionic salt known and is predicted to exhibit superconducting behavior under pressure. The high-pressure electronic properties of this material were investigated using diamond-anvil cell electrical conductivity techniques to above 100 GPa. These measurements show that BeReH9 transforms to a metal and then to a superconductor above 100 GPa with a maximum in Tc near 7 K (Fig. 1). The occurrence of superconductivity is confirmed by the suppression of the resistance drop on application of a magnetic field. The transition to the metallic phase is sluggish, but is accelerated by laser irradiation. Raman scattering and x-ray diffraction measurements, used to supplement the electrical measurements, indicate that the Ba-Re framework is largely preserved on compression at these conditions, but there is a possibility that hydrogen atoms are gradually disordered under pressure. This is suggested from the sharpening of peaks in the Raman spectra and x-ray diffraction patterns by heat treatment as well as by the temperature dependence of resistance under pressure. The data suggest that the transition to the superconducting state is first order, and is associated with the breakdown of the material [T. Muramatsu et al., J. Phys. Chem. C 119, 18007 (2105)].